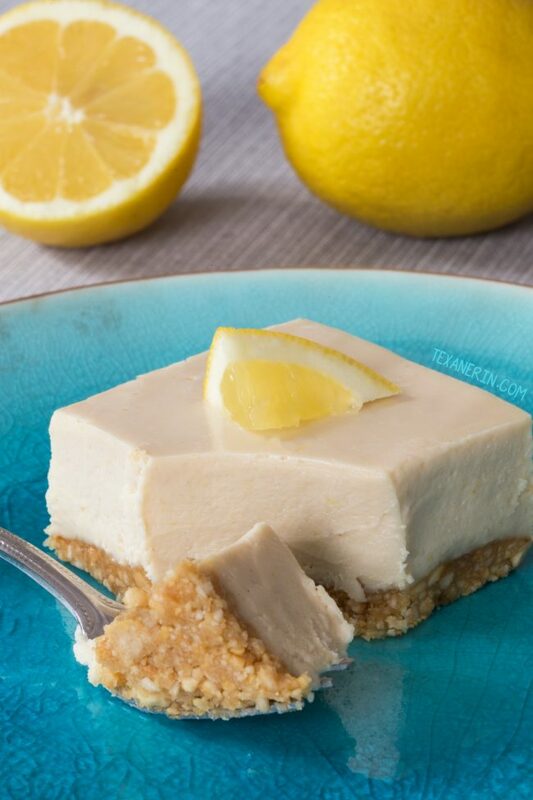 Paleo lemon bars with a super creamy, cashew-based vegan and no-bake topping! Full of lemon flavor and maple-sweetened. These pictures and the video don’t do the bars justice. At all. They’re really so much better than they look! I tried to make them a pretty, bright yellow color like regular lemon bars so I added some turmeric but I could definitely taste it. It wasn’t strong but I didn’t want anything messing with the lemon taste. I doubt anyone will care about the drab color once they’ve had their first bite! 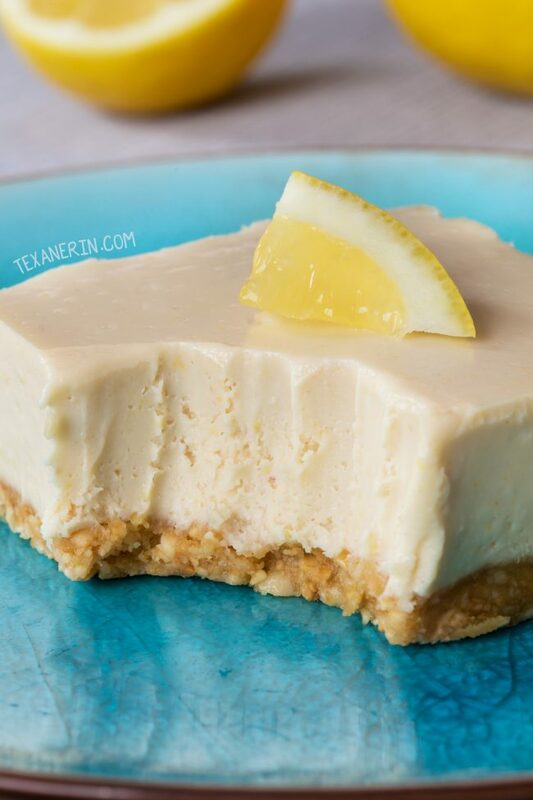 First of all – if you haven’t tried my paleo vegan key lime pie, you need to do that! The filling really tastes just like regular key lime pie filling. This paleo lemon bar recipe is based off that one. One difference is that I needed a little more sweetener, which I find really odd. Is lemon more sour than lime? I also 1.5x the recipe so that the bars would be super thick. The size of the bar in the picture is ridiculous. To be honest, it’s probably 50% larger than it should be. The plate I wanted to use was huge so I had to cut a giant piece so that the bars wouldn’t look dinky. This “only” makes an 8″x8″ pan but you can cut the bars pretty small. They’d be great for Easter! These carrot cake paleo magic cookie bars from Food Faith Fitness would also be a great option for Easter dessert! Lemon bars can sometimes be sickeningly sweet. I love lemon curd but regular lemon bars are just too much for me. These lemon bars are definitely different! For another not-so-sweet treat, try my vegan paleo lemon cookies. Imagine key lime pie – but with lemon. There’s no maple or cashew taste. Just lemon. That said, if you hate cashews, don’t make these. Also be sure to use light maple syrup! While my bars didn’t taste maple-y, I’m guessing yours will if you use a darker grade maple syrup. I first made these paleo lemon bars with raw unsalted cashews. If you want to make raw lemon bars, go ahead and use raw cashews and untoasted coconut. If you don’t care about them being raw, definitely go with roasted cashews and coconut! It adds so much flavor. The other thing to remember is salt. Don’t be skimpy with the salt, especially in the filling. If your filling tastes flat or boring, you’re missing salt. My cashews were super salty and I know every brand is different, so I can’t give you an exact amount of salt. I also tested these paleo lemon bars with partly bottled lemon juice and not using the full amount of zest and I don’t recommend futzing around with that. It’s just like in my paleo lemon curd – you want to use freshly squeezed juice! They last for several hours at room temp. It’s 70 degrees F in my apartment and I’ve had them out all day. They’re best when still at least a little chilled, though. These paleo lemon bars freeze great! They take about 2 hours to defrost at room temperature (in the winter). You can also let them defrost overnight in the fridge. If you’ve ever tried no-bake vegan or paleo crusts, you’re probably familiar with how wet or even soggy they can be. Not this one! It’s not crisp like a baked wheat-based crust but it’s definitely not soggy. At least it’s not as long as you don’t over-process the crust mixture in the blender. If you prefer a whole wheat crust, use the coconut sugar cookie crust I used in my gluten-free key lime pie bars. It’d go great with this filling! These blueberry lemon oatmeal bars also look fantastic and I’m pretty sure they could be made with white whole wheat in place of the AP flour. These blackberry lemon cheesecake bars also look dreamy. Just use gluten-free or whole wheat graham crackers in place of the regular ones. Line an 8"x8" pan with a piece of parchment paper. Prepare the crust. Heat a pan over medium-high heat and add the coconut. Stir frequently until nicely toasted. Do not walk away from the pan as the coconut starts to burn very quickly! Pour the coconut into a small bowl and let cool for about 5 minutes. You can skip the toasting step but I think it adds so much flavor to the crust! Press onto the bottom of the prepared pan. Make sure there aren't any holes and really press down to compact it. Place the pan in the freezer while you prepare the filling. The fridge will also do if you don't have space in the freezer. It should be firm before putting the filling in. Wipe out the blender jar using a paper towel and place all the filling ingredients in there. Blend for about 30-60 seconds at high speed until totally smooth. Pour the filling over each crust. Refrigerate for about 4 hours or until firm. If you're in a hurry, place the pan in the freezer. Refrigerate bars an airtight container for up to 3 days. If you freeze them for a while, they'll need about 70-80 minutes at room temperature to defrost or about 1 1/2 - 2 hours in the refrigerator. Once properly defrosted, they should be totally creamy. While I'm sure the crust can be made in a food processor, I'm not sure about the filling. It definitely wouldn't be as smooth (using a high-power blender, it's totally smooth) and it may not work at all. If you try it anyway, let us know how it goes! 63 comments on “No-bake Paleo Lemon Bars (vegan, gluten-free, grain-free)” — Add one! Lemon bars are my favorite. No PALEO lemon bars are my favorite. Can’t wait to dig in! These lemon bars look amazing -so rich and creamy! I can’t wait to give them a try! I love lemon everything so am digging this recipe. What a great sweet treat! Lemon filling curdled. Any tips? Was your coconut cream cold? That’s the only thing I can think of! Despite these changes, the end result was very creamy and tasty. I’m happy that they came out well for you! And thanks for sharing your changes. :) Good to know that they work well with unsalted raw cashews. Thanks for your comment! I hope Foil works because I didn’t have any parchment paper. Maybe I should not have used anything?? Also, hope my sister likes this vegan version….she is lactose free, so I was going for dairy free, and also a healthy version. I am bringing them to Easter Dinner, so I will let you know!! I think foil would be fine! I hope you and your sister and everyone else will enjoy them. I think they’re delicious even for people who can eat dairy (like me) so hopefully she won’t mind that they’re vegan. :) Happy Easter! These lemon bars look delicious! I love the creamy texture and would never have guessed it’s paleo! I just made this so it’s too late to ask now ;) But I didn’t have the right 8×8 dish and I also have always wanted to make a lemon pie type thing. So I put this in a pie shell. Do you think that will be good? like a cheesecake kind of? or way too intense? Thank you! I’m allergic to coconut…what could I use instead of toasted coconut, coconut cream and coconut oil? I’d have to recommend that you use a different recipe since the coconut cream and oil are a huge part of the recipe. Sorry about that! Omg I just made these and couldn’t help but luck the insides of the vitamix! Can hardly wait till the set to try them! Haha. Well that’s always a good sign! So happy you liked them. :) Thanks for your comment! Would you roast your raw cashews, then soak them? Yup! Someone mentioned using raw cashews instead of roasted and they liked it that way, so you could always just skip the roasting step. These are sooooo good! For some reason, my Vitamix couldn’t handle the crust ingredients, so I used the food processor. Definitely will be making these again. Even my hubs who doesn’t like Paleo LOVED these! Will be trying some of your other desserts too! Thanks! Aww, yay! Always a good thing when picky husbands approve. :) So happy that you both enjoyed the bars! Thanks a bunch for your comment. Can cashew butter be used? I haven’t tried it but I’m guessing it’d work if you use the same amount (by weight) for the filling. It wouldn’t work for the crust. I used a food processor. It took a while to cream the nuts, but it worked fine. I just left it on while I went about other business in the kitchen until the texture looked good. That’s awesome! I’m very happy that these are able to be made in a food processor. :) Thanks a bunch for your comment! I have raw cashews on hand. How do I roast them? Can you use raw cashews? I don’t think the color is drab at all! I love it! Plus they came out perfectly! 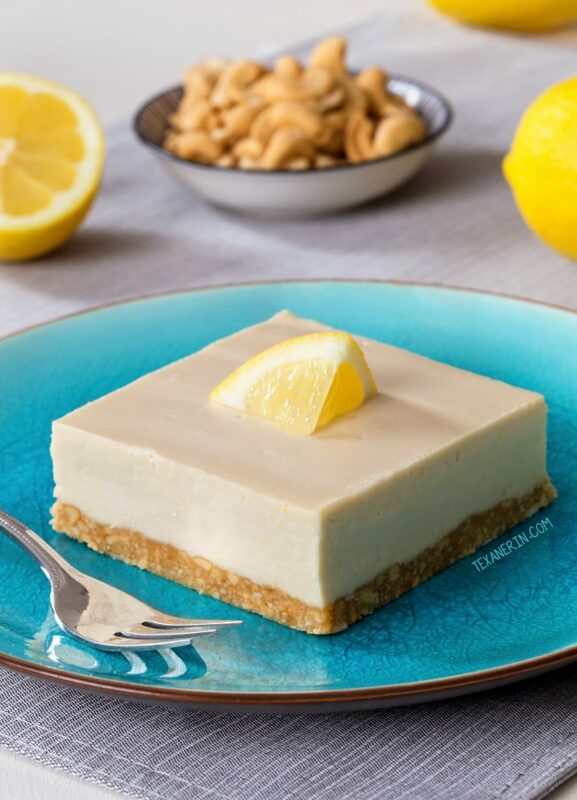 My son is a huge lemon fanatic and his birthday is right around the corner but unfortunately is allergic to nuts, so I can’t make this for him. Looks and sounds delicious though. Glad to see you back. I’m sorry for all the nut-filled recipes! I know I post a ton of those these days. I hope your son will have a lovely birthday. :) Thanks for stopping by to say hi! Do not apologize for all of the nut filled recipes. I love them. I just have a son who is allergic to all nuts or is advised to stay away from all nuts after testing positive for almonds, walnuts, and hazelnuts. I am big on anything chocolate and peanut butter and that is what I gravitate towards and unfortunately most of my homemade goodies have nuts in them because they are typically healthier than anything else. I am sometimes at a loss as to what to make for my nut allergy son that is on the healthy side of sweet treats. I still want to try your lemon fudge recipe that uses coconut butter…I do believe. He might like those! My lemon fudge is also cashew-based. :/ But I understand how hard it is to bake healthy without nuts. Since October, I’ve only eaten fruit, vegetables, meat, honey and coconut products (I prepared tons of recipes in advance so I’d have something to post). Turns out that I’m allergic / intolerant to a ton (or even most) of what I’ve been eating my entire life, except fruit, veggies and meat. 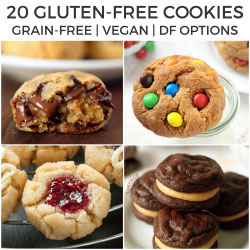 Hopefully I can come up with some nut-free goodies soon! Can he do seeds? There are a lot of great recipes using both sunflower butter and tahini. Hi!I made these yesterday in a food processor they came out smooth and delicious 😉 Thanks for the the recipe! Awesome! That’s great news. 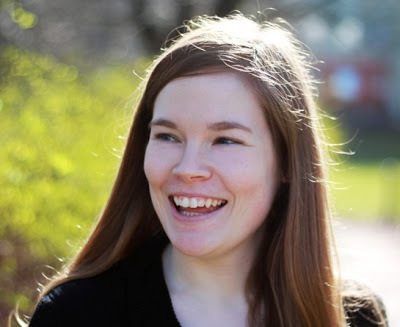 :) Thanks a bunch for your feedback! I’m so happy you liked them. I’m obsessed! I’ve been looking for a healthy lemon bar that wasn’t loaded with chemicals! It is my son’s birthday next week and he is a lemon fanatic!! Can’t wait to try! The texture of these looks absolutely perfect! What a yummy treat! I’m a total sucker for anything lemon, and these sound so good! Perfect spring time treat! Love the lemon! These lemon bars look so creamy and perfect for spring! These look so pretty and loved watching your video! Takes the intimidation out of trying new things. Yum! The addition of cashews to this is such an amazing idea! p.s. what do you think about using agave for some/all for the maple syrup in the filling? It’s lighter and sweeter, I think, so I’m going to try it and will let you know. I’ve only used agave a few times years ago and so I really have no idea. You can always add more sweetener once everything is mixed together, so maybe start off with 1/2 cup? You definitely made up for it! These look so good and springy and it’s trying so hard in our part of Germany to be spring so these are on for the weekend. AND love that you can freeze them. Hope you’re feeling your old self again. Aww, thanks! I thought I’d better come back with a recipe that everyone could enjoy. :) I’m feeling a little better but it needs to be spring already! No more of this sunshine for an hour, then rain, then 10 minutes of sunshine stuff. It plays with my emotions. ;) I’d love to hear how the lemon bars come out. I hope you’ll love them as much as we did! Thank you! :) I don’t have that info but you can copy and paste the recipe here for the nutritional profile, if you’d like. I unfortunately have no idea if these can be made with stevia as I’ve never used it. Sorry about that! I think they are beautiful, even though they’re not as yellow! They look creamy and delicious. I will come over and eat your “too big” lemon bar btw. IMPOSSIBLE. oh and ps, I’m with you, absolutely no futzing around with bottled lemon juice. Just don’t. :) Thanks for the link love! !